So much as been said and written about Miles Davis' "Kind of Blue", it's virtually impossible to summarize all the info to the length of this page. We could simply list some facts (best sold Jazz album ever worldwide). "This painterly masterpiece is one of the most important, influential and popular albums in jazz. At the time it was made, Kind of Blue was also a revolution all its own. Turning his back on standard chord progressions, trumpeter Miles Davis used modal scales as a starting point for composition and improvisation — breaking new ground with warmth, subtlety and understatement in the thick of hard bop." We could try to explain why it's the best jazz album ever made, but the music itself will do that. As Bill Evans said in the original liner notes for the record, the band did not play through any of these pieces prior to recording. Miles Davis laid out the themes before the tape rolled and the band improvised. The end results were fragile and wondrous. 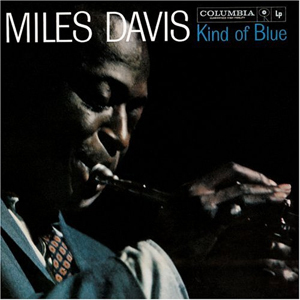 Recorded during two sessions in 1959, Kind of Blue worked on many different levels and will do so for many years to come. This is a very special version of the most influential jazz album ever.